1 A None No Power Seat 1 A is a standard Business Class seat, however the proximity to the lavatories and galleys may be bothersome. There is no floor storage for this seat during takeoff and landing. 1 C None No Power Seat 1 C is a standard Business Class seat, however the proximity to the lavatories and galleys may be bothersome. There is no floor storage for this seat during takeoff and landing. 1 D None No Power Seat 1 D is a standard Business Class seat, however the proximity to the lavatories and galleys may be bothersome. There is no floor storage for this seat during takeoff and landing. 1 G None No Power Seat 1 G is a standard Business Class seat, however the proximity to the lavatories and galleys may be bothersome. There is no floor storage for this seat during takeoff and landing. 1 H None No Power Seat 1 H is a standard Business Class seat, however the proximity to the lavatories and galleys may be bothersome. There is no floor storage for this seat during takeoff and landing. 1 K None No Power Seat 1 K is a standard Business Class seat, however the proximity to the lavatories and galleys may be bothersome. There is no floor storage for this seat during takeoff and landing. 15 A None No Power Seat 15 A is a standard Economy Class seat that has extra legroom due to the exit. The tray table is in the armrest, making the armrest immovable and slightly reducing seat width. There is no floor storage for this seat during takeoff and landing. 15 B None No Power Seat 15 B is a standard Economy Class seat that has extra legroom due to the exit. The tray table is in the armrest, making the armrest immovable and slightly reducing seat width. There is no floor storage for this seat during takeoff and landing. 15 C None No Power Seat 15 C is a standard Economy Class seat that has extra legroom due to the exit however, the proximity to the lavatory may be bothersome. The tray table is in the armrest, making the armrest immovable and slightly reducing seat width. There is no floor storage for this seat during takeoff and landing. 15 D None No Power Seat 15 D is a XL Economy Class seat that has extra legroom. An extra surcharge may be required to book this seat. The proximity to the lavatory may be bothersome as people may congregate in this area. The tray table is in the armrest, making the armrest immovable and slightly reducing seat width. There is no floor storage for this seat during takeoff and landing. 15 F None No Power Seat 15 F is a XL Economy Class seat that has extra legroom. An extra surcharge may be required to book this seat. The proximity to the lavatory may be bothersome as people may congregate in this area. The tray table is in the armrest, making the armrest immovable and slightly reducing seat width. There is no floor storage for this seat during takeoff and landing. 15 G None No Power Seat 15 G is a XL Economy Class seat that has extra legroom. An extra surcharge may be required to book this seat. The proximity to the lavatory may be bothersome as people may congregate in this area. The tray table is in the armrest, making the armrest immovable and slightly reducing seat width. There is no floor storage for this seat during takeoff and landing. 15 H None No Power Seat 15 H is a standard Economy Class seat that has extra legroom due to the exit however, the proximity to the lavatory may be bothersome. The tray table is in the armrest, making the armrest immovable and slightly reducing seat width. There is no floor storage for this seat during takeoff and landing. 15 J None No Power Seat 15 J is a standard Economy Class seat that has extra legroom due to the exit. The tray table is in the armrest, making the armrest immovable and slightly reducing seat width. There is no floor storage for this seat during takeoff and landing. 15 K None No Power Seat 15 K is a standard Economy Class seat that has extra legroom due to the exit. The tray table is in the armrest, making the armrest immovable and slightly reducing seat width. There is no floor storage for this seat during takeoff and landing. 3 D None No Power Seat 3 D is a standard Business Class seat whose proximity to the galley behind may be bothersome. 3 G None No Power Seat 3 G is a standard Business Class seat whose proximity to the galley behind may be bothersome. 34 A None No Power Seat 34 A is a standard Economy Class seat that may have limited recline. The proximity to the lavatories may be bothersome as people may congregate in this area. 34 B None No Power Seat 34 B is a standard Economy Class seat that may have limited recline. The proximity to the lavatories may be bothersome as people may congregate in this area. 34 C None No Power Seat 34 C is a standard Economy Class seat that may have limited recline. The proximity to the lavatories may be bothersome as people may congregate in this area. 34 D None No Power Seat 34 D is a standard Economy Class seat that may have limited recline. The proximity to the lavatories may be bothersome as people may congregate in this area. 34 F None No Power Seat 34 F is a standard Economy Class seat that may have limited recline. The proximity to the lavatories may be bothersome as people may congregate in this area. 34 G None No Power Seat 34 G is a standard Economy Class seat that may have limited recline. The proximity to the lavatories may be bothersome as people may congregate in this area. 34 H None No Power Seat 34 H is a standard Economy Class seat that may have limited recline. The proximity to the lavatories may be bothersome as people may congregate in this area. 34 J None No Power Seat 34 J is a standard Economy Class seat that may have limited recline. The proximity to the lavatories may be bothersome as people may congregate in this area. 34 K None No Power Seat 34 K is a standard Economy Class seat that may have limited recline. The proximity to the lavatories may be bothersome as people may congregate in this area. 4 C None No Power Seat 4 C is a standard Business Class seat whose proximity to the galleys may be bothersome. 4 H None No Power Seat 4 H is a standard Business Class seat whose proximity to the galleys may be bothersome. 40 A None No Power Seat 40 A is a standard Economy Class seat that has extra legroom due to the exit however, the proximity to the lavatories may be bothersome as people tend to congregate in this area. The tray table is in the armrest, making the armrest immovable and slightly reducing seat width. There is no floor storage for this seat during takeoff and landing. 40 B None No Power Seat 40 B is a standard Economy Class seat that has extra legroom due to the exit however, the proximity to the lavatories may be bothersome as people tend to congregate in this area. The tray table is in the armrest, making the armrest immovable and slightly reducing seat width. There is no floor storage for this seat during takeoff and landing. 40 C None No Power Seat 40 C is a standard Economy Class seat that has extra legroom due to the exit however, the proximity to the lavatories may be bothersome as people tend to congregate in this area. The tray table is in the armrest, making the armrest immovable and slightly reducing seat width. There is no floor storage for this seat during takeoff and landing. 40 D None No Power Seat 40 D is a XL Economy Class seat that has extra legroom. An extra surcharge may be required to book this seat. The proximity to the lavatories may be bothersome as people may congregate in this area. The tray table is in the armrest, making the armrest immovable and slightly reducing seat width. There is no floor storage for this seat during takeoff and landing. 40 F None No Power Seat 40 F is a XL Economy Class seat that has extra legroom. An extra surcharge may be required to book this seat. The proximity to the lavatories may be bothersome as people may congregate in this area. The tray table is in the armrest, making the armrest immovable and slightly reducing seat width. There is no floor storage for this seat during takeoff and landing. 40 G None No Power Seat 40 G is a XL Economy Class seat that has extra legroom. An extra surcharge may be required to book this seat. The proximity to the lavatories may be bothersome as people may congregate in this area. The tray table is in the armrest, making the armrest immovable and slightly reducing seat width. There is no floor storage for this seat during takeoff and landing. 40 H None No Power Seat 40 H is a standard Economy Class seat that has extra legroom due to the exit however, the proximity to the lavatories may be bothersome as people tend to congregate in this area. The tray table is in the armrest, making the armrest immovable and slightly reducing seat width. There is no floor storage for this seat during takeoff and landing. 40 J None No Power Seat 40 J is a standard Economy Class seat that has extra legroom due to the exit however, the proximity to the lavatories may be bothersome as people tend to congregate in this area. The tray table is in the armrest, making the armrest immovable and slightly reducing seat width. There is no floor storage for this seat during takeoff and landing. 40 K None No Power Seat 40 K is a standard Economy Class seat that has extra legroom due to the exit however, the proximity to the lavatories may be bothersome as people tend to congregate in this area. The tray table is in the armrest, making the armrest immovable and slightly reducing seat width. There is no floor storage for this seat during takeoff and landing. 47 A None No Power Seat 47 A is a standard Economy Class seat that is missing a window. 47 K None No Power Seat 47 K is a standard Economy Class seat that is missing a window. 49 C None No Power Seat 49 C is a standard Economy Class seat however, other flyers tend to bump into this seat since it juts out into the aisle. 49 H None No Power Seat 49 H is a standard Economy Class seat however, other flyers tend to bump into this seat since it juts out into the aisle. 50 A None No Power Seat 50 A is a standard Economy Class seat in the last row of the aircraft that may have limited recline. The proximity to the lavatories and galleys may be bothersome. 50 C None No Power Seat 50 C is a standard Economy Class seat in the last row of the aircraft that may have limited recline. The proximity to the lavatories and galleys may be bothersome. 50 D None No Power Seat 50 D is a standard Economy Class seat however, the proximity to the lavatory may be bothersome. 50 G None No Power Seat 50 G is a standard Economy Class seat however, the proximity to the lavatory may be bothersome. 50 H None No Power Seat 50 H is a standard Economy Class seat in the last row of the aircraft that may have limited recline. The proximity to the lavatories and galleys may be bothersome. 50 K None No Power Seat 50 K is a standard Economy Class seat in the last row of the aircraft that may have limited recline. The proximity to the lavatories and galleys may be bothersome. 51 D None No Power Seat 51 D is a standard Economy Class seat in the last row of the aircraft that may have limited recline. The proximity to the lavatories and galleys may be bothersome. 51 F None No Power Seat 51 F is a standard Economy Class seat in the last row of the aircraft that may have limited recline. The proximity to the lavatories and galleys may be bothersome. 51 G None No Power Seat 51 G is a standard Economy Class seat in the last row of the aircraft that may have limited recline. The proximity to the lavatories and galleys may be bothersome. Air Europa flies the Boeing 787-800 with 298 seats in a two-class configuration of Business and Economy. While this emergency exit window seat offers unrestricted left room for your right leg, for the left it is severely restricted by the exit door. Therefore after some time it becomes very uncomfortable. 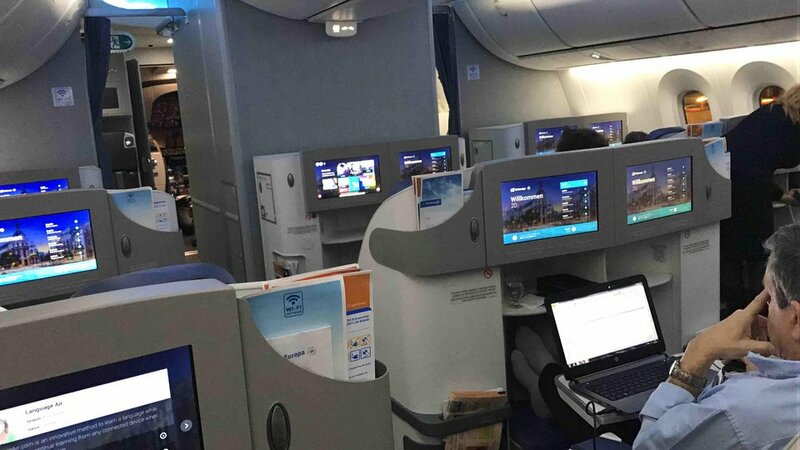 Last May we flew MAD/MIA on business class for the first time, so my husband and I were looking forward to the experience. While AE's service before and during the flight was excellent, the seats 2A and 2C were not. These seats have very little cushioning, no lumbar support and hard to be in them on a long flight. Actually, our Virgin Atlantic Premium Economy seats on our MIA/MAD flight were more comfortable. Additionally annoying was the fact the TV screens don't tilt, which means you can't recline too far back without the screen getting distorted and totally unwatchable - no possibility of lying flat and watching a movie here. Very confortable flight with full lie flat seats. 1D is the only seat in Business where a crib can be put. Flew this bird mia-mad. Plane was brand new. Seats are cloth covered, which I prefer to "pleather" due how it breathes. Seat itself was comfortable padding wise, and had a good adjustable headrest and decent recline for coach. Seat pitch is a tight 31 inches, which, sadly, is becoming industry standard. It is also rather narrow, a problem frequently cited against 3-3-3 configured dreamliners (again, industry standard). Flight was made pleasant by the FA's who proactively helped to move pax around the cabin such that everyone had an empty seat next to him/her. They really went above and beyond, and that is why I had a good experience (flight was only around 66% full). I wouldnt look forward to flying regular coach transatlantic if this plane were full, but I might willingly endure it for a low fare. Air Europa flies 1 versions of Boeing 787-800.